If "Coffee" is the theme for your wedding, look to these 3 steps to provide ideas for incorporating the theme into all aspects of your wedding! Invitations: There are several ways to incorporate the theme in your invitations. One way, which tends to be whimsical, is to have a java motif as part of the invitation design. 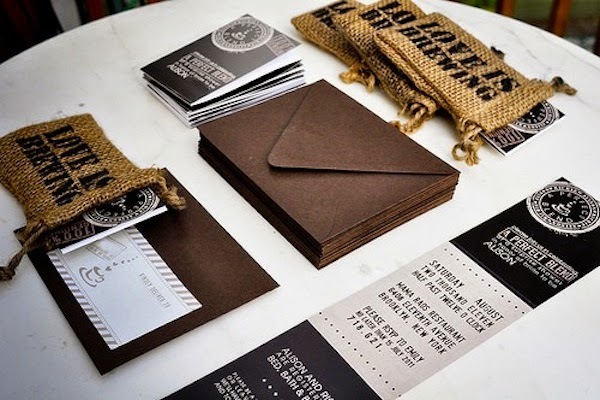 A quick search on 'coffee invitations' will bring up many options for you, from the very casual to the more formal. If you are still looking for a more traditional wedding invitation, then think incorporating a brown bean color as part of the invitation, whether it is the border, a damask pattern, the font color, etc. 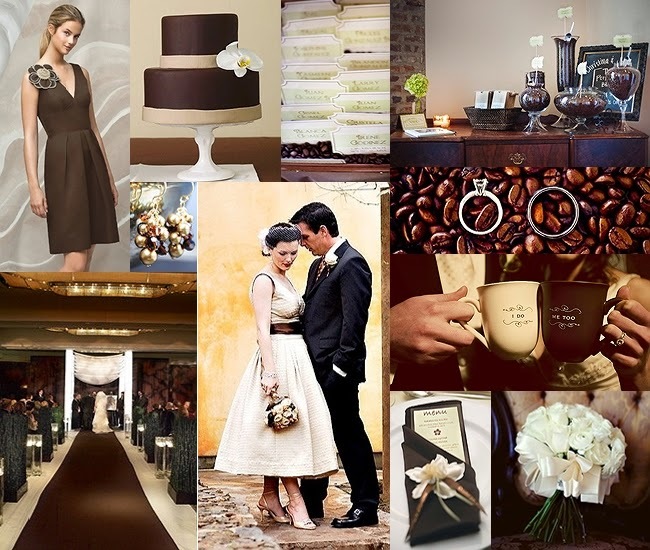 Brown and Ivory is a beautiful color combination that lends itself perfectly to a formal occasion such as a wedding. Of course an important part of coffee is its rich aroma. So put a bean or two in each envelope to scent the invitation. When your guests open the invitation they will immediately understand that java is going to have a starring role at the wedding! Have A Coffee Bar at the Reception: And make sure that knowledgeable baristas are staffing it; it will definitely add to the ambiance. Offer several different types (a bold, a lighter roast, a flavored and a decaf are ideal) as well as all the fun additions that people can add on their own (cocoa, cinnamon, cream, etc.). Of course have lattes, cappuccinos, frappuccinos, and espresso available at the bar. Having personalized coffee cup sleeves made for occasion is a very nice touch - one that is unexpected and fun. 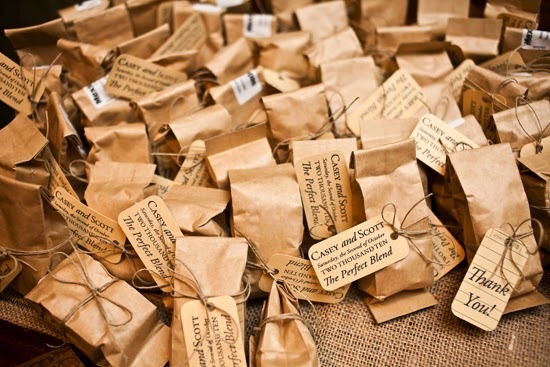 A Java Inspired Wedding Favor Is A Must: What could be more appropriate than sending home your guests with a 'thank you' gift of coffee? Many sites now offer packages with personalized labels but, before you order, make sure that the description tells you what kind of bean the coffee is made from. You don't want to give bad coffee which, unfortunately, is what some favor sites offer. Or talk to a local café whose blend you happen to like and see if you could purchase 2 or 4 oz. sizes and then make your own wedding label to stick on it. Another lovely favor would be to give each guest a 'gift card' for a coffee drink at a brand that has stores in most cities (Starbucks, Caribou, etc.). Put it in a personalized gift card holder and you've got a terrific favor (one that won't be left behind). Personalized lottery ticket holders would also work as gift card holders. I hope this article helped you as you plan your coffee wedding.